This dynamic new whitepaper discusses seven key areas that all social media practitioners and organizations should be thinking about to help businesses continue to grow and thrive their social media programs throughout the year. The paper was produced by Spredfast, a leading provider of Social CRM software for social media monitoring, engagement, coordination, measurement and integration. Spredfast is also a Social: IRL sponsor. Your customers are at the heart of everything you do – or should be doing – in social media. How are you learning about their preferences, activity and interactions to help inform your decisions? Social media has moved far beyond just social media marketing. How are you planning to help roll out social media beyond just Marketing efforts to achieve business goals in departments throughout the business like Sales, R&D, Customer Care, HR or Public Relations? Expanding social media throughout the your business is complex. How are you planning to operationalize social media with internal processes, communication standards and workflows to make the activity seamless between teams and people? Content is at the heart of everything you do in social media. But that doesn’t mean it has to be all new content or that it should exist in a vacuum. What content do you have that should be used across you social channels and how can this be used in an engaging way? Creating good experiences is the key to successful social media programs. What do your customers want or need to experience to make their interactions positive and unique with your brand? Social media initiatives are one part of a greater business initiative. And because of that, they need to be integrated into greater systems and reporting dashboards so that they can add context to overall goals. What are your social media programs yielding in terms of social impressions, activity from your internal teams and engagement from your target audience? Regardless of where you are in your social planning and strategy efforts, these seven areas are key to hone in on from a social media perspective. They can help make your current social programs richer and also ensure you are planning with an eye toward future social business success. 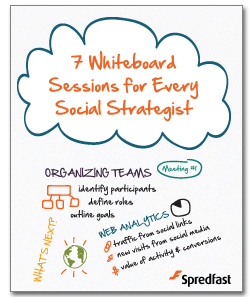 In preparing this whitepaper, Spredfast took a creative approach in presenting each area of opportunity as a “whiteboard session”, with ideas on how to approach planning and assessment and an action plan to get started. Importantly, the “whiteboard sessions” can be used as the foundation for a series of meetings designed to foster discussion and secure the buy-in needed to make your efforts successful. For a brief overview of the whitepaper, check out the Executive Summary embedded below. To access the complete 36 page whitepaper click here. You’ll just need to complete some very basic registration information and will then receive a free PDF download. Kudos Spredfast. A great resource with a practical, fun and creative approach. Thanks for sharing our new resource, Ben! We had a lot of fun and learning in getting insight from the market and thinking through how this information could be most useful to social strategists. Hope your readers enjoy!